What if I told you that you could finally have that fireplace you’ve been dreaming of for an affordable price? Would you look at me out of the corner of your eye and question whether or not I’ve lost it? I remember the day we watched that movie together, and you went on and on about how much you admired that Tudor style fireplace. Well, I’ve found them, and online, of all places, where you can shop through an amazing selection of Tudor style fireplaces at prices that will surprise you. Having a fireplace in the home just adds something warm and inviting to the place. It gives the room an entirely different feel. It makes you want to snuggle up with your favorite book while listening to Bing Crosby and the fire cackling in the background. It makes you want to drink a glass of wine and unwind after a hard day at the office. It makes you want to dance under the mistletoe with the one who has your heart. Having a Tudor style fireplace really adds something special to a home. These fireplaces offer a special sense of style to a room. Hand carved with intricate detailing, it’s the perfect addition and center piece for the rustic look in your home. A fireplace can be a great fixture in any room. Picture a room that features beautiful wood floors, tall ceilings, and primitive décor. In the center of a red accent wall is the perfect sandstone fireplace in all its provincial glory with berry garland beautifully strewn across the mantel. There’s a fire creating a warm glow in the fireplace and scented candles lit around the room. This is the kind of room you want to come home to. This is the kind of room you want to fall in love in. This is the kind of room you want to raise a family in. A fireplace does something to a home that no other single item can do. It creates a place for family and friends to gather and share smiles, laughter, and tears. It creates warmth in a way that no heater or other type of heating device can. It turns a home into a haven and gives the room it’s in a truly inviting feel. Coming home to a house with a fireplace feels like truly coming home, in every sense of the word. Adding a fireplace to your home is the perfect way to bring it to life. Adding a Tudor fireplace will really jazz it up and give you a home you can’t wait to get home to. The beautiful mantels on a Tudor style fireplace are the perfect place to display your favorite photographs, stunning artwork, or beloved treasures. The best Tudor fireplaces aren’t the most expensive. In fact, you’ll likely be stunned at just how affordable they are. Now is the time to finally get yourself that fireplace you’ve always wanted. 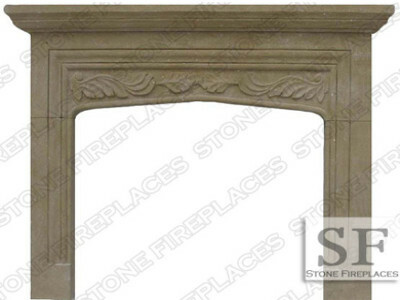 Make your home come alive with the addition of a stunning Tudor fireplace.